Aching knees? Solutions can range from classic knee joint pain RICE treatment (rest, ice, compression, elevation) to strengthening exercises to surgery. Knee joint pain remedies typically start with RICE (rest, ice, compression, exercise) and should also include exercise—but may end up involving alternative treatment or surgical procedures. Exercise is universally recommended for aching knees and knee joint pain. If there’s any doubt, however, ask your doctor before beginning a knee pain exercise program. The idea is to first allow time for pain, inflammation, and swelling to subside, and then to strengthen the muscles that support the knee joint and increase range of motion without doing additional damage. Don’t overdo it. Start gradually and slowly increase the intensity, resistance, and duration of exercises. Two of the best are the basic exercises described below: the Knee flexion and the Knee Extension. Editor’s note: Suffering from knee joint pain? This post offers helpful knee pain exercises along with surgical and complementary medicine treatments. In a companion post, we cover conservative, non-invasive knee pain remedies. Knee Flexion: Stand behind a sturdy chair and hold on for balance. Lift your right foot and bend your leg at the knee as far back as possible toward your buttocks. Hesitate at the top and slowly return to the starting position. Do 8 to 10 repetitions, two sets, for each leg. Rest for one minute between sets. Knee Extension: Sit in a sturdy straight-back chair, arms at sides, and knees bent at 90 degrees. Slowly extend your right leg fully in front, then return to the starting position. With each leg, perform 8 to 10 repetitions, two sets. Rest for one minute between sets. 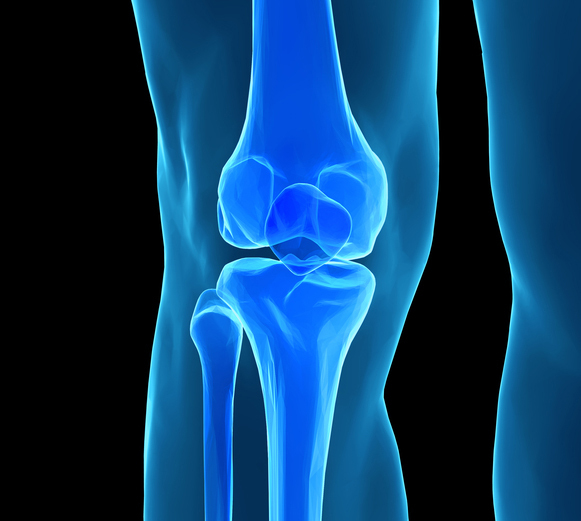 What are Surgical Options for Knee Pain? If non-invasive treatments have failed to relieve osteoarthritis-related knee pain, surgery may be an option. The most common procedures are arthroscopy, partial knee replacement, and total knee replacement. Arthroscopy: The surgeon makes an incision in the knee joint just large enough to insert a lighted tube and surgical instruments. The surgeon then sees what’s inside by watching a television monitor to make an assessment of damage caused by osteoarthritis and/or perform certain procedures, such as the following. Partial knee replacement (PKR): PKR involves replacing one of three knee compartments—the medial compartment (inner knee), the lateral compartment (outer knee), or the kneecap. The damaged area is removed, replaced with a metal and plastic prosthetic, and attached with bone cement. Total knee replacement (TKR): The surgeon removes damaged joint and bone tissue, then smooths the worn-out ends of the tibia (shin bone) and femur (thigh bone). All or part of the damaged joint is replaced with either a metal or polyethylene cap. What About Alternative or Complementary Knee Pain Remedies? Some methods that have been considered complementary are now accepted components of medical care in many major hospitals in the U.S. Acupuncture is an example, but there are many others. Acupuncture: Results from a number of studies suggest that acupuncture may help relieve knee pain, according to the National Center for Complementary and Integrative Health. The effectiveness of acupuncture varies, depending on the nature of the pain, the location, the person administering it, and the patient receiving treatment. In other words, it doesn’t work for everyone. Chondroitin and glucosamine: Research on the effectiveness of chondroitin and glucosamine has produced conflicting results over the past two decades, and the uncertainty continues. “In general,” according to the National Center for Complementary and Integrative Health (NCCIH), “research on chondroitin has not shown it to be helpful for pain from knee or hip osteoarthritis.” The NCCIH adds that it is unclear whether glucosamine helps with knee pain or if either supplement lessens pain in other joints. Tai chi: Tai chi may improve pain, stiffness, and joint function in people with knee osteoarthritis, and it may improve balance and stability. It is especially effective in older adults because it is safe and can be practiced at different intensity levels. Indirectly, exercise of any kind seems to reduce pain, so tai chi qualifies. Yoga and other mind/body practices: Yoga has been shown to relieve pain caused by a number of conditions, but not knee pain specifically. It’s possible that yoga simply doesn’t help knee pain, or that no studies have proven that it does. Magnets: There is no conclusive evidence that magnets can reduce knee pain. In addition, research does not specify how strong magnets should be, how long they should be applied, whether they could be harmful, or exactly how they work. Stem cell therapy: There is no evidence that stem cell therapy can delay or reverse the damage done to knees or other joints. Stem cell therapy has not been fully validated by studies, it’s expensive, and possible side effects include infection and cancer (some stem cells can become cancer cells). The bottom line is that further research is needed before stem cell therapy moves from alternative/complementary medicine to mainline, traditional medicine. aching knees, bone, cartilage, exercise, exercise program, inflammation, joint pain, knee joint, knee joint pain, knee pain, knee pain remedies, knee replacement, osteoarthritis, pain, pain remedies, partial knee replacement, total knee replacement. Thank you for sharing useful information. It is really a great blog.